Off of a two-lane road in unincorporated Plymouth, Michigan, hidden among a thick tree line, is an American icon. 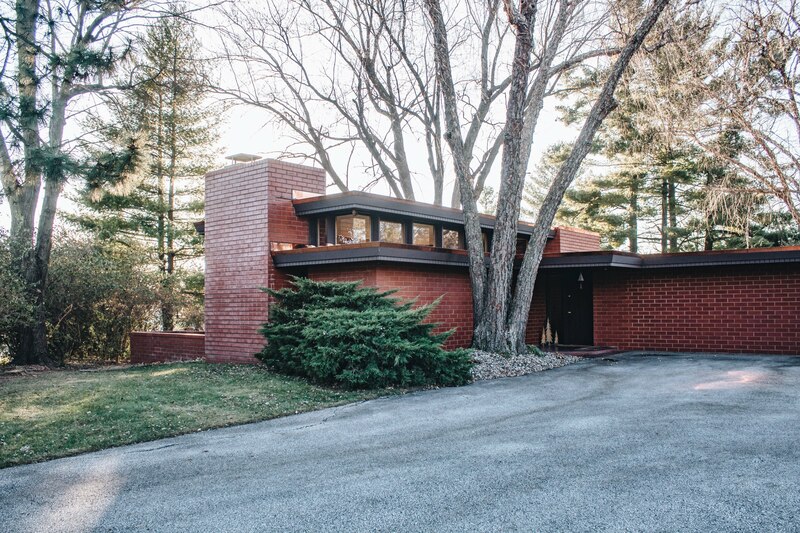 Its striking lines and burnt-red color are out of sight, obscured by the rise of a sloping driveway. A closed gate and security cameras send a very clear message to visitors: don’t bother us here. 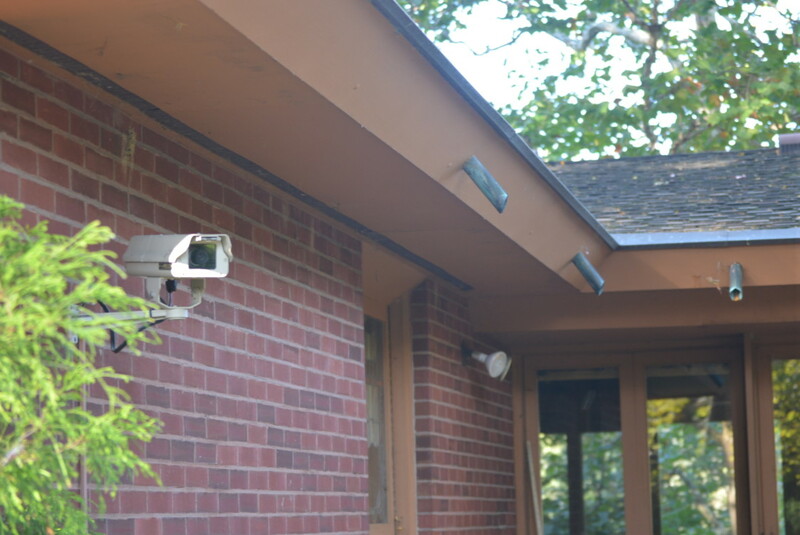 A security camera keeps a watchful eye over the Goddard premises. At the Lewis Goddard House, a privately owned 1953 Frank Lloyd Wright home, every attempt has been made by the owners to stop the incessant flow of curious visitors ringing the gate buzzer and leaving their fan mail in the mailbox out front. Dave Ohryn, who married into the Cook family’s Wright ownership, is the only reason I’ve even made it this far. His wife Karen, he tells me, would have thrown out my desperate plea for an interview (“We happen to get a lot of notes”) without a second thought. After all, the Ohryns are, as Dave keeps repeating, a private family. It’s telling that this precept keeps popping up in our initial conversation; it’s hard to say if it’s a warning or simply an explanation. The Goddard home is one of many remaining privately owned Wright homes, drawn up by America’s most renowned architect for Lewis Goddard, a sales manager for Goddard & Goddard Company in Detroit, to house himself and his four daughters. Briefly owned by Domino’s owner Tom Monaghan, the home, along with the neighboring Carlton D. Wall house, has since been owned by the Cook/Ohryn family. Karen has spent roughly three decades in the Carlton D. Wall house. Owning a Wright home is in many ways a great gift; the architect who redefined the conventional living space built homes that instantly stand out for their unbroken lines, full windows, and wide open great rooms. It’s easy to recognize the dark wood and colored brick, warm and enveloping. It’s a history museum built to live in. Not all Wright owners have the same mindset. 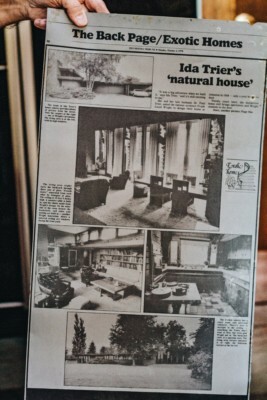 Jane Paulsen and her husband, Ken, own the Paul Trier home in Johnston, Iowa, a suburb just north of Des Moines. It was commissioned by Jane’s parents, Paul and Ida Trier, and finished in 1958. After moving out as an adult, she bought the house back when her mother passed. The Paulsens have lived there for eight years but still aren’t over the occasional stream of curious guests trailing through their driveway or yard. Call it a welcome change. When the house was first built, it was as though an alien had landed in Johnston. Ida Trier, Paulsen’s mother, said nothing. Maybe it was a little true. There were questions about how the Triers could afford the services of a man like Wright, whose lengthy resume at that point included a civic center in Baghdad and a hotel in Tokyo. They expressed those concerns to the famous architect, who was uncharacteristically flexible with them. Wright’s initial design, which would have cost the Triers $34,000 in 1958, was made more cost-effective through the use of lower-end materials. The house went up, remaining largely the same ever since, faithfully maintained by the Triers and now the Paulsens. Unfortunately, such dutiful preservation comes at numerous costs. Wright’s visions for the American living experience were radical then and remain perhaps even more divisive now. The layouts don’t always make sense for day-to-day living. This is apparent immediately in the Goddard home. Upon entry, a hallway more akin to a submarine corridor sits on the left. Walking down the passage reveals four doors, evenly spaced, that each open to a bedroom not much larger than 10 square feet. When this house was first built, the furniture in the bedrooms was preinstalled: a desk with a bed that would slide out from underneath. Ann Galezio, daughter of Lewis Goddard, says it wasn’t nearly as constrictive to her as it might be to current generations. Paulsen had similar memories growing up. Paulsen recalled that her mother was a bit dismayed to leave behind their beloved bed set from a prior home, but there simply wasn’t room for it anywhere amid all the pre-installed furniture. And that furniture wasn’t great. Though Wright designed much of it, it’s hard to tell if he actually thought people would use it. “No one, I mean, nobody, sits here,” Ohryn says. The reason is obvious. The chairs are unbelievably low to the ground. For reference, I’m a flat six feet tall in shoes. Sitting in one of the Paulsens’ chairs, I have to either fully extend my legs in front of me or hunch my knees up to my ribs. The theory with the low chairs was that Wright wanted to compensate for low ceilings. The low ceilings, then, stemmed from the Usonian ideal that each home should blend and join with the surrounding prairie landscape. Some other practicalities were sacrificed at the altar of idealism. The master bedroom’s shower in the Trier house was initially built with wood paneling — an unfathomable design both then and now. It was finished with the same surface applied to bar countertops as a method of waterproofing, but such a method was beyond ineffective. The shower leaked constantly. Worse, when the Triers tried to tile over the wood, they merely trapped moisture in the wet wood behind the tiling. This caused a mildew problem. The shower has since been entirely overhauled, but the Paulsens use it as a go-to when indicating Wright’s infamous impracticality. Strange proportions and ill-planned panels are just some examples of the Wright ideas that govern his home construction. But Wright’s impractical vision wasn’t confined to wooden showers and tiny hallways. Wright often touted that his houses weren’t built to survive beyond a century. Over half a century since his death, the houses are starting to make good on his promises. “He was more concerned with motion and design versus the practicality,” says Steve Jaskowiak, an architect with West Studio Construction Services in Elmhurst, Illinois. Jaskowiak, a Chicago native, studied architecture at University of Illinois-Chicago, and his own home takes on some of Wright’s aspects — just not all of them. “You can see elements of what he did: some good, and some kind of a caricature,” Jaskowiak admits. There’s a reason. 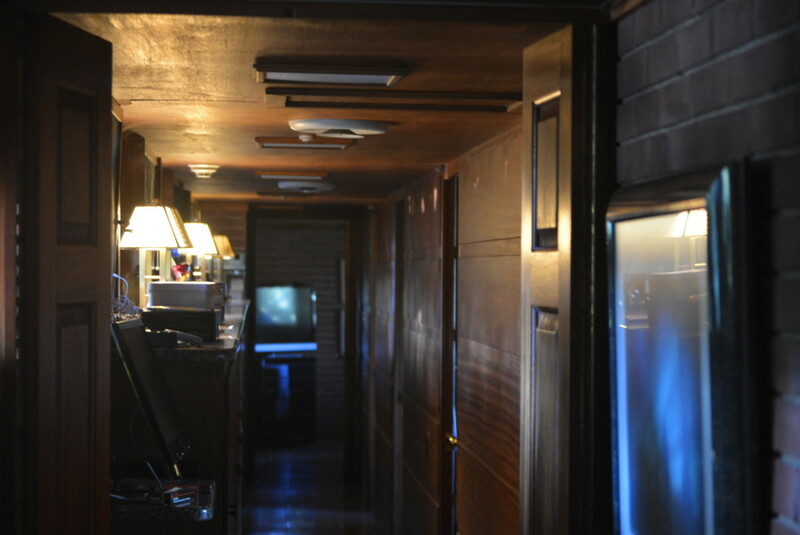 Numerous owners of Wright’s Usonian homes — homes designed for his vision for prairie living — have suffered leaky or sagging roofs. The flat roofs, made of all natural materials, weren’t able to effectively drain or dispose of the rainwater they collected. Clients often find Jaskowiak when they’re scared away from the ballooning maintenance costs that Wright homes can pose. He offers a contemporary solution with, you guessed it, a sloped roof. 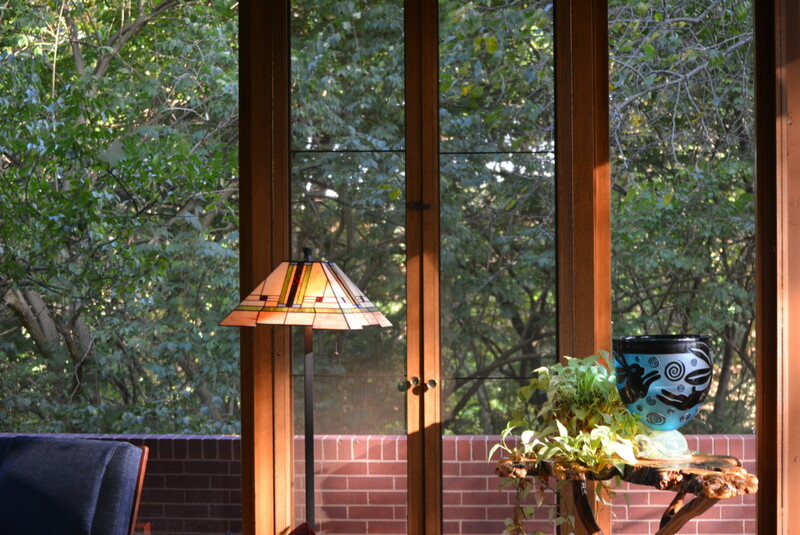 His homes incorporate the vibrant earth tones and 90-degree angles of a true Usonian while acquiescing to the modern demands of homeowners; still, there’s no mistaking where Jaskowiak’s inspiration stems from. Unfortunately for those already in Wright homes, there are really only two options. 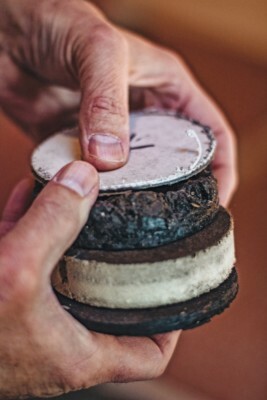 Some owners, like the Ohryns, have simply shrugged off the costs and dealt with the issue. Others, like the Paulsens, have replaced their roofs with a contemporary system. Beneath and around the stress of owning and maintaining a Wright home is a community of people all sharing in their experiences. The Paulsens are close friends with the Donovans, another Iowan Wright family, and Abigail Donovan’s historical knowledge of the Trier house has enhanced the friendship. The Donovans and Paulsens met at a conference in Scottsdale, Arizona, and Abigail was quick to provide Jane and Ken with artifacts and information that she’d accrued over the years. Among the collectibles was a scaled model of the Trier house, constructed by students at Iowa State University. 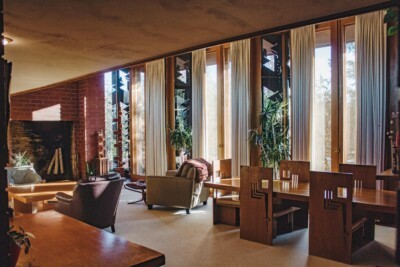 Owners have also leaned on historical societies like the Frank Lloyd Wright Trust and the Taliesin Associated Architects, who provided the Paulsens with Wright-consistent plans for an addition to the Trier home. That relationship cuts both ways. The FLW Trust prefers that owners keep their roofs stock whenever possible, meaning that preventative maintenance is often discouraged until it’s too late. For the Paulsens, putting on their membrane roof was a matter of preserving the rest of the house at the cost of changing a small portion. Ohryn also expressed a desire to undo his changes to the two houses in the future. He’s converting the Goddard house into an office space (“for the tax breaks,” he tells me) and the Wall house will remain a residence, though it sounds like it will change a little bit in the coming years. The house is just visible through the trees at the edge of the Goddard home. It’s much larger, more imposing. As I’m walking around the Goddard house for photos, I can’t help myself. I try to snap a few pictures of the Wall house across the field. “Oh, you’re in trouble now,” says Ohryn after I finish rounding the house for photos. He’s putting down the phone as he says it, my driver shaking his head at me just out of Dave’s sightline. It’s his wife on the line, who’s spotted me from the Wall windows. Visitors are still not welcome. Taking the hint, I shake hands with Ohryn once more, walk to the car, and leave the Goddard House. The gate closes behind us on the way out, once more shielding an American masterpiece from the public. Featured image by Jenna Cornick.